Nike is well-known for its athletic wear, but earlier this week, the corporation entered the political fray when it announced Monday that former 49ers quarterback Colin Kaepernick — best known for kneeling during the national anthem to protest racism and police brutality — would be the face for the company’s 30th anniversary of its “Just Do It” campaign. The ad has sparked heated debate across social media — but this is actually shrewd marketing. Backing human rights causes grants Nike positive publicity and promotes much-needed conversation about social justice throughout the United States, which still faces a plethora of racial issues. But Nike’s new ad hasn’t been greeted with praise from all walks of life. On Twitter, infuriated conservatives declared Nike’s campaign unpatriotic — some even posted videos of themselves burning Nike shoes in protest. In the wake of thousands of angry social media posts, Nike’s stock dropped nearly 3 percent on Tuesday. But those vitriolic tweets represented only a minority of comments about the ad. According to Twitter data from Sprinklr, over half a million tweets contained either the hashtag #JustDoIt or #Nike and only 100,000 included the hashtags #Nikeboycott or #BoycottNike — so while detractors of the ad received the most media attention, they make up a smaller portion of Nike’s consumer base. Nike’s target consumer base — young people — overwhelmingly supports political action in corporations. More than 90 percent of millennials say they would switch brands to one associated with a cause. So while Nike has suffered financially in the short term, it’ll likely reap the benefits of its target audience in the near future, especially since Nike’s past political campaigns have been successful. Nike’s “Equality” campaign, which was released at the Grammys in 2017, featured tennis star Serena Williams, a transgender swimmer and a Muslim fencer who competes in a hijab. The video received polarizing feedback from the media — just like the Kaepernick ad — but ultimately boosted Nike’s stock values. But beyond monetary issues, Nike’s new ad has convinced major corporations and people across the country that race issues matter. The NFL, which previously threatened to suspend players who didn’t stand for the national anthem, released a statement supporting Kaepernick’s cause Tuesday. 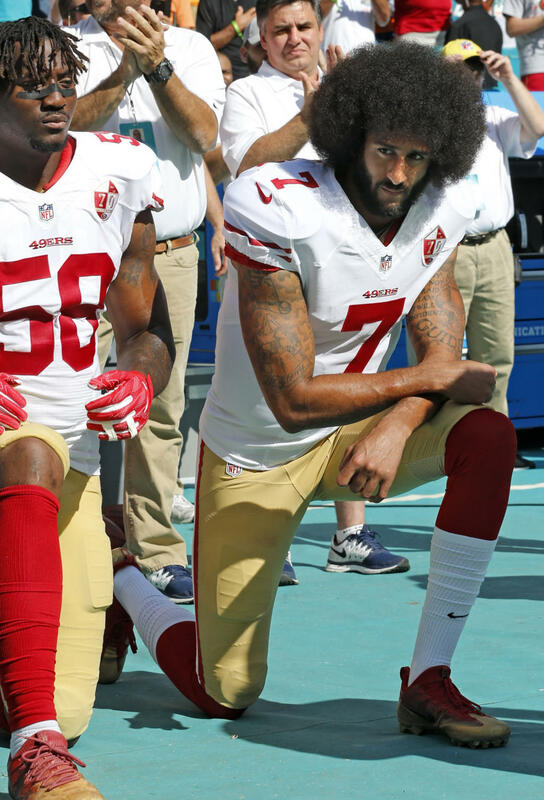 “The social justice issues that Colin and other professional athletes have raised deserve our attention and action,” a spokesperson for the NFL said. There were perhaps more deserving athletes for this campaign based solely on athletic ability, but professional credentials aren’t enough to represent a major brand anymore. In this day and age, when seemingly every facet of life has turned political, companies need to up the ante by supporting progressive causes. And in the sporting world, there’s no greater spokesperson for progressive causes than Kaepernick.